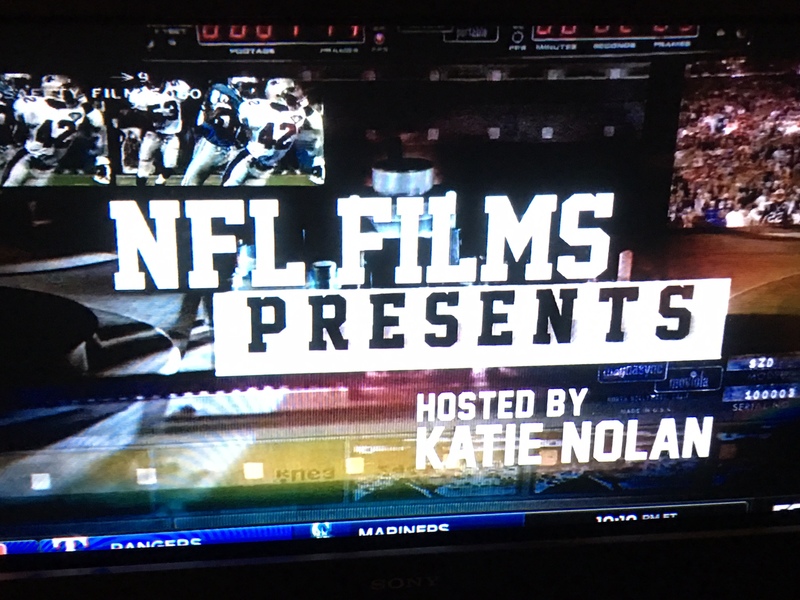 Katie Nolan is the new host of NFL Films Presents, so why isn't Fox promoting it? Katie Nolan is the new host of NFL Films Presents, so why isn’t Fox promoting it? NFL Films Presents is almost like something at a restaurant that is on a secret menu. It’s not as celebrated as Hard Knocks, A Football Life, or Inside The NFL, but loyal viewers will tell you it’s a real gem. When it was on ESPN2 it rarely aired in the window it said it was on the guide meaning if you DVR’d it you’d often get a partial recording or none at all. It also would air sporadically but without any consistency on NFL Network but only days after its airing on ESPN2. Several years ago NFL Films Presents moved over to FS1 where I imagine the already modest ratings probably took a dip as most things/people do when making that perilous voyage from Bristol to LA (modern day version of The Oregon Trail video game). Basically, there haven’t been many casual viewers for a while. Like that off menu sandwich or pastsa dish, you have to go out of your way to consume it…. nobody just impulsively gets it. 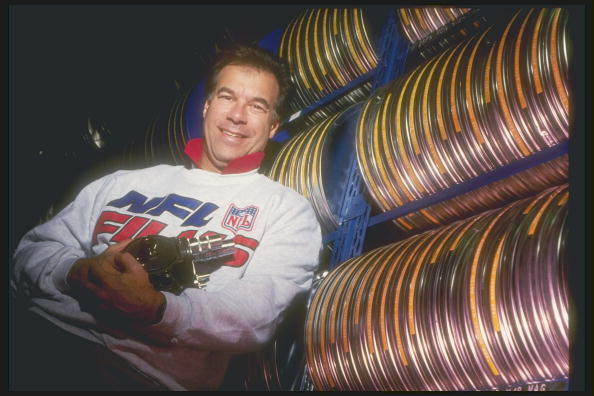 Also not working in the show’s favor has been the hosting situation since Steve Sabol’s passing. The legendary Sabol was a huge part of Presents but ever since his death, the show has experimented with no physical host and having just a a narrator. There was also one really awkward year with Joe Buck which kind of fizzled out towards the end as his MLB playoff and NFL duties basically made Presents a very low priority which was evident to the viewers, many of which were not keen on his hosting to start with. New season. New Host. #NFLFilmsPresents returns tonight at 7:00pm/ET on @FS1! We’re told the decision for Nolan to host was a joint one between NFL Films and Fox although that’s not exactly how a PR rep from Fox explained it to us. It was basically the same arrangement as two years ago where Fox tabbed Joe Buck and NFL Films ran with it. There was no announcement or release about the new season. FS1’s Twitter account was too busy posting videos of hot takes from Shannon Sharpe and Jason Whitlock to tell followers the season premiere was on and Nolan was the new host. Nolan didn’t even tweet out to watch the show she’s now hosting which is really odd given people will tweet out every mundane thought or detail of their day these days. Nolan was kind enough to tweet me back as I was growing a bit frustrated with the lack of clarity on the situation and her explanation helps explain the lack of promotion and the modest amount of on-screen time she had. Even with that explanation, I’m a bit miffed at how the new season rolled out. I get the show is not exactly doing monster ratings but not much is on FS1. The show and the news of a new host wasn’t even tweet worthy. So thinking about this a bit… FS1 cares enough about NFL Films Presents and Katie Nolan to pair them up to cross pollinate audiences a bit hoping to build awareness for both Nolan and Presents, but they don’t care enough to actually announce the development? NFL Films social accounts did mention that Nolan was the new host but it wasn’t 100% clear if that would be for the entire season or just a one off. The FS1 social team didn’t feel compelled to promote the show’s season debut as well as one of the network’s most popular personalities now hosting the show seems really odd given the nominal time it takes to craft a tweet or status update. I’ll spare you from a rant on what I perceive to be a lack of good faith stewardship over Steve Sabol’s pet project and a huge part of his legacy. It just seems that the show seems to have zero significance for FS1 despite parachuting in Nolan in as host. Given NFL Films Presents is a show that doesn’t have two men yelling at each other about whatever is deemed as “trending” or fits into a narrative of society becoming PC bros, I have to imagine Presents could be on the move again whenever the current agreement ends. As for Nolan as the host, the initial episode was pretty lackluster but some of that can be explained by her tweet about the late start. She mostly debuted some new edgy material about the Patriots, a bold new direction for Nolan . It’s an attempt to bring humor to the show as well as perhaps make the show’s audience skew a bit younger and more diverse as I imagine it’s an older male demo. I have no idea if it will work. I like Nolan a lot (saying this will no doubt bring out some terrible comments), but the fit seems odd especially if her and Fox are not exactly overly enthused in the assignment and show itself. It will be interesting to see it how goes as the Joe Buck experiment started off bad and got worse pretty quickly although Nolan indicates things will pick up. I’ll leave with this suggestion. Presents needs a dedicated host and a network who loves the NFL and the show itself as well as understands the legacy of the show and Steve Sabol. I’m skeptical that FS1 and Nolan fit the bill and that’s not a knock on Nolan but rather just how the program fits on the network (it doesn’t…..last year it was followed by TMZ Sports) and how Nolan fits with that audience (I’m more bullish here but I think that’s a big ask of her and one the network doesn’t seem to be doing much to help in that effort). With that in mind, I’d love to see ESPN reacquire the show and give the hosting gig to Chris Berman in his rumored emeritus role. I’m not a big Berman fan these days but that would probably be better for FS1, ESPN, NFL Films, and Chris Berman and would stabilize the show after a few rocky years. I think viewers would be all for this and I’m pretty sure Steve Sabol would be too.